Bukhchuluun Ganburged (Bukhu) is a master student of the Music and Dance Conservatory of Ulaanbaatar. 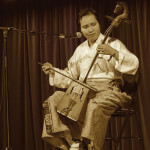 Performing the folk musics of Mongolia, and exploring the aural dimensions of sounds generated by traditional instruments and harmonic overtone vocal techniques. Based in Sydney, Australia since 2009. Bukhu was granted most prestigious Distinguished Talent Visa by the Australian government as an internationally recognised artist with exceptional and outstanding contributions to the arts.